Gluttony, greed, sloth, envy, lust, wrath, and pride are the seven deadly sins that can destroy society. No matter where you live, how old you are, or what you believe, these sins can have a strong impact on your personal life. But did you know that these sins also apply to your professional life? The same bad habits and sins that affect your life can also send your business down the wrong path. This is especially the case when it comes to your website and customer experience. Greed, sloth, and envy can transform your company into a brand that no one wants to interact with. Do you want to avoid falling prey to these three deadly sins of website customer experience? Keep reading to find out how you can stay in the limelight and then contact Spectoos to get started! The internet, like the universe itself, is infinite and ever-expanding. Accept that you cannot be in all places at once and should not attempt to be everything to everyone. For 64% of B2B marketers, social media management is just one of their job responsibilities, so it can’t take up all of your time. In your social marketing efforts, for example, you may find endless lists of the social networks out there. You do not need a presence on all of them, and trying to maximize the number of social networks you use will distract you from the positive benefits that can come from truly engaging with your audience on the networks that matter to them. Instead, based on your ideal customer persona, make a short list of 3-5 networks frequently used by your customers. B2B companies may find that LinkedIn is best for them, B2C may prefer Instagram, while Facebook, Twitter, and YouTube may be a winner for both. Or, if your business targets a specific niche, perhaps one of the smaller networks is right for you. Do your research, test your hypothesis and track your results. 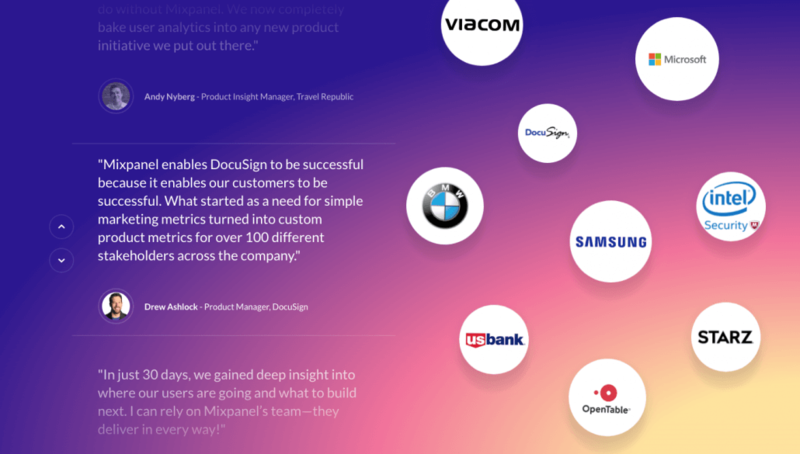 The top section of their page mentions key concerns of their potential customers: understanding every user’s journey, driving customer loyalty, and making data driven decisions. Scrolling down, they offer logos of some of their current customers that potential companies can identify with along with customer reviews combined with real pictures of their real customers—faces, names, and titles that prospects can relate to and trust – to convey their message. Example 2 of a solid website customer experience from MixPanel. Notice they do not try to sell to doctors or athletes. They understand their market and target the specific users that have been proven to convert for their company. Who does your website target? Are you directing your efforts to the personas that are most fruitful for you? You need to research your own company’s buyer personas to before you can create the same solidified website customer experience. Look through your contact database to uncover trends about your current customers. Reach out to current and potential customers (leads) to interview them about their company, job position, wants, needs, etc. Ask yourself these 20 questions on identifying your audience as put together by HubSpot. Use the HubSpot Make My Persona tool for an easy-to-use way to determine your buyer personas. Search engine optimization is WONDERFUL. We love it, we do it, and we think you should do it, too. However, too many websites are focusing their content and design only on SEO and failing to target the real people who arrive at their site. In reality, you should be focusing your content on people first and search engines second. The truth of the matter is that search engines such as Google will reward your efforts to focus on people with better SEO, so it’s a win-win. Don’t be lazy about your SEO. Stuffing your page with too many keywords and creating a lot of mediocre (or just plain bad) content only for SEO makes your site unusable, unfriendly and frankly search engines can see through these tricks anyway. Instead, focus on creating content for people. This is what will enhance your website customer experience. Develop educational content that explains how best to use your product or service or gives insight into your industry. Create content that addresses your customer’s pain points/struggles and provides solutions that are valuable. Give actionable advice that your customers can implement immediately for positive results. So, by all means, optimize your site for better search engine ranking, but not at the expense of your website customer experience. When competitors do something well, especially something that converts website visitors to paying customers, you may turn green with envy. But before you copy their initiative, STOP! Duplicating content and copying initiatives is not helpful. It destroys trust with your customers (and damages SEO efforts). Instead, examine the successful campaign, learn from it, and duplicate its success (without duplicating its content). For example, if yours is a B2B Marketing Technology company that competes with MixPanel (the site discussed above), for the attention of small-to-medium online businesses, you were probably impressed by their testimonial section. 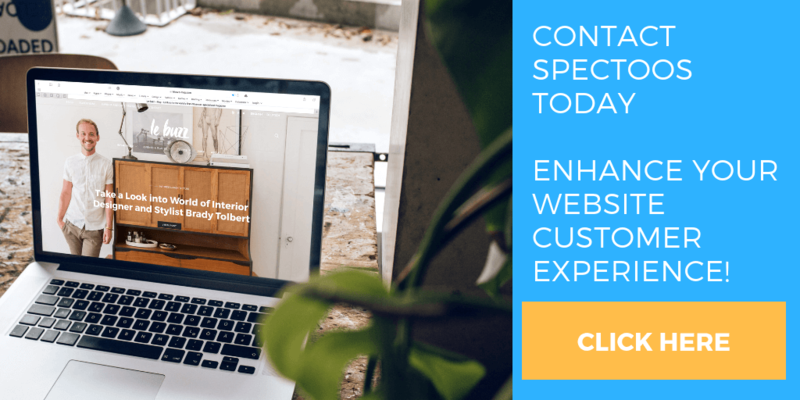 Before you copy their design and ask your customers to “one up” their testimonials, think about what could make the endeavor even better and gain the full SEO power of your testimonials. Don’t copy your competitor’s success out of envy. Be smart about it. Get inspiration, do research, and find a solution that is even better than theirs is! Want to be the envy of your competitors? Sign up for Spectoos today! Unlike a guilty junk food obsession that’s obviously gluttony, you may have not even realized that your business was committing some of the sins described above. But if your marketing efforts are greedily spreading yourself too thin, slothly focusing on SEO vs. customer experience, or enviously duplicating content, you must stop. These practices are hurting your efforts and more importantly, your reputation. Instead, transform your sins into positive attributes: focus on your niche audiences, build your content for readers, first (and search engines, second), and learn from competitors, but do not duplicate their efforts. Do you find yourself guilty of these sins? Have you managed to correct your ways and invest more in your website customer experience? Did you see any difference in the way users react to your site? Please share your story below.